The IBM 3490 is a family of Magnetic Tape Subsystems designed to provide significant tape subsystem performance and cartridge capacity improvements. The 3490-A01 is a 18-track, 1 Control Unit component for an IBM 3490 tape subsystem. The Model A01 supports the 3490 Models B02 and B04 Tape Drive Units. The Model A01 can be field upgraded to either a Model A02 or Model A10, providing granularity from a minimum 1x2 (A01 x B02-18 track) configuration to a maximum 2x8 (A10 x four B20-36 track) configuration. Included as standard in the Model A01 is Improved Data Recording Capability (IDRC) and a 2Mb buffer. Components are serviced from the rear to minimize operational interference. The 3490-A02 is an 18-track, 2 Control Unit component for an IBM 3490 tape subsystem. The IBM 3490 Model A02 supports the 3490 Model B02 and B04 18-track Tape Drive Units. The subsystem will occupy approximately 50 percent less floor space than a comparable 3480 configuration by incorporating up to two control unit functions in one box. The Model A02 can be field upgraded to a Model A20, providing granularity from a minimum 2x2 (A02 x B02-18 track) configuration to a maximum 2x16 (A20 x four B40-36 track) configuration. Included as standard in the Model A02 is Improved Data Recording Capability (IDRC), dual communications capability, and a 2 Mb buffer. Components in the control units are serviced from the rear to minimize operational interference. The 3490-A10 is a 36-track, 1 Control Unit component of an IBM 3490 tape subsystem. The IBM 3490 Enhanced Capability (3490E) Model A10 Control Unit supports the Models B20 and B40 Tape Drive Units. The A10 can be field upgraded to the A20, providing granularity from a minimum 1x2 (A10 x B20) configuration to a maximum 2x16 (A20 x Four B40s) configuration. Included as standard are: Improved Data Recording Capability, an 8 Mb buffer and improved utilization of ES Connection* (ESCON*) adapters providing new possibilities in performance, connectivity, and remote tape operations. The 3490-A20 is a 36-track, 2 Control Unit component for an IBM 3490 tape subsystem. The IBM 3490 Enhanced Capability (3490E) Model A20 Control Unit supports the Models B20 and B40 Tape Drive Units. The A20 provides granularity from a minimum 2x2 (A20 x B20) configuration to a maximum 2x16 (A20 x Four B40s) configuration. Standard features include: Improved Data Recording Capability, an 8 Mb buffer, Dual Communications Capability, and improved utilization of ES Connection* (ESCON*) adapters providing new possibilities in performance, connectivity, and remote tape operations. 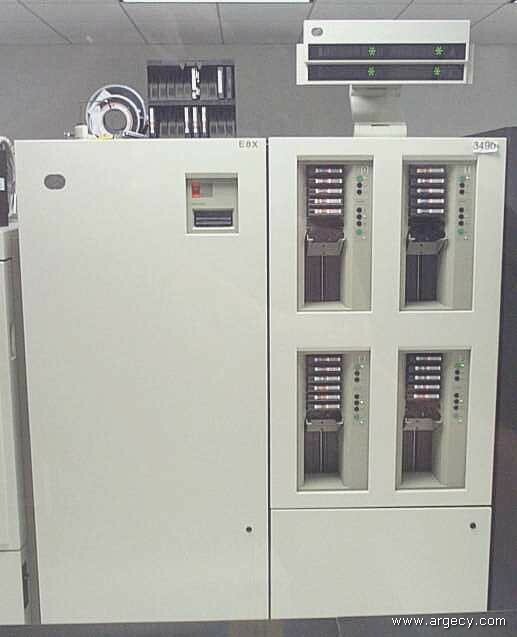 The 3490-B02 is an 18-track, 2-drive component for an IBM 3490 tape subsystem. Standard features Include: Improved Data Recording Capability, cartridge loaders on both drives, and a 2Mb buffer. The moveable message display is improved in readability and character size. The Model B02 can be field upgraded to either the 3490 Model B04 or Model B20, providing granularity from two 18-track tape drives to four 18-track tape drives or two 36-track tape drives. Components in the drive units are serviced from the rear to minimize operational interference. The 3490-B04 is an 18-track, 4-drive component for an IBM 3490 tape subsystem. The subsystem will occupy approximately 50 percent less floor space than a comparable 3480 configuration by incorporating four-drive packaging and by placing up to two control unit functions in one box. Standard features include: Improved Data Recording Capability, cartridge loaders on every drive, and a 2Mb buffer. The moveable message display is improved in readability and character size. The Model B04 can be field upgraded to a Model B40 providing granularity from a minimum two drive 18-track configuration to a four drive 36-track configuration. Components are serviced from the rear to minimize operational interference. The 3490-B20 is a 36-track, 2-drive component for an IBM 3490 tape subsystem. It is designed to provide significant tape subsystem performance and cartridge capacity improvements. The B20 Tape Drive Unit writes in a new Enhanced Capability format and uses the existing cartridge system tape and is capable of reading cartridges in earlier formats, providing for ease of migration. The B20 can be field upgraded to the B40, providing granularity from a minimum two 36-track tape drive configuration to a maximum four 36-track tape drive configuration. The 3490-B40 is a 36-track, 4-drive component for an IBM 3490 tape subsystem. It is designed to provide significant tape subsystem performance and cartridge capacity improvements. The B40 Tape Drive Unit writes in a new Enhanced Capability format and uses the existing cartridge system tape and is capable of reading cartridges in earlier formats, providing for ease of migration. The 3490-C10 is a 36-Track, 1 Control Unit, 1 drive, tape system. The Model C10 is a low-cost, rack-mountable member of the IBM 3490 Magnetic Tape Subsystem Enhanced Capability family, providing significant performance and cartridge capacity improvements for midrange systems. The 3490E Model C10 is fully compatible with existing 3490E models, using both the Cartridge System Tape and the longer 3490E Enhanced Capacity Cartridge System Tape, and are read-compatible with earlier cartridge formats for ease of migration. The Enhanced Capability format (36-track bi-directional recording), together with standard Improved Data Recording Capability (IDRC) and the higher capacity tape, dramatically increase overall cartridge capacity. This increased capacity and standard Utilization of ES Connection (ESCON*) Channels provides new possibilities in performance, connectivity, and remote tape operations. The model C10 is not offered on RS/6000. The 3490-C11 is a 36-track, 1 Control Unit, 1-drive, Autoloader, tape subsystem. The Model C11 is a low-cost, rack-mountable member of the IBM 3490 Magnetic Tape Subsystem Enhanced Capability family, providing significant performance and cartridge capacity improvements for midrange systems. The 3490E Model C11 is fully compatible with existing 3490E models, using both the Cartridge System Tape and the longer 3490E Enhanced Capacity Cartridge System Tape, and are read-compatible with earlier cartridge formats for ease of migration. The Enhanced Capability format (36-track bi-directional recording), together with standard Improved Data Recording Capability (IDRC) and the higher capacity tape, dramatically increase overall cartridge capacity. This increased capacity and standard Automatic Cartridge Loader (ACL) on the C11 model combine to address the data capacity requirement for unattended backup on mid-range systems. Utilization of ES Connection (ESCON*) Channels provides new possibilities in performance, connectivity, and remote tape operations. This model is supported on AS/400, RS/6000, and ES/9000 systems. The 3490-C22 is a 36-track, 1 Control Unit, 2-drive, Auto load, tape subsystem. The Model C22 is a low-cost, rack-mountable member of the IBM 3490 Magnetic Tape Subsystem Enhanced Capability family, providing significant performance and cartridge capacity improvements for midrange systems. The 3490E Model C22 is fully compatible with existing 3490E models, using both the Cartridge System Tape and the longer 3490E Enhanced Capacity Cartridge System Tape, and are read-compatible with earlier cartridge formats for ease of migration. The Enhanced Capability format (36-track bi-directional recording), together with standard Improved Data Recording Capability (IDRC) and the higher capacity tape, dramatically increase overall cartridge capacity. This increased capacity and standard Automatic Cartridge Loader (ACL) on the C22 model combine to address the data capacity requirement for unattended backup on mid-range systems. Utilization of ES Connection (ESCON*) Channels provides new possibilities in performance, connectivity, and remote tape operations. This model is supported on AS/400, RS/6000, and ES/9000 systems. The 3490E-C1A is fully compatible with existing 3490E models, using both the Cartridge System Tape and the longer 3490E Enhanced Capacity Cartridge System Tape, and is read-compatible with earlier cartridge formats for ease of migration. The Enhanced Capability format (36-track bidirectional recording), together with standard Improved Data Recording Capability (IDRC) and the higher capacity tape, dramatically increase overall cartridge capacity. The C1A is specifically designed for use in the 3494 Tape Library Dataserver and cannot be used outside of the tape library. Utilization of ES Connection (ESCON*) Channels provides new possibilities in performance, connectivity, and remote tape operations. This model is supported on AS/400, RS/6000, and ES/9000 systems. The 3490E-C2A is fully compatible with existing 3490E models, using both the Cartridge System Tape and the longer 3490E Enhanced Capacity Cartridge System Tape, and is read-compatible with earlier cartridge formats for ease of migration. The Enhanced Capability format (36-track bidirectional recording), together with standard Improved Data Recording Capability (IDRC) and the higher capacity tape, dramatically increase overall cartridge capacity. The C2A is specifically designed for use in the 3494 Tape Library Dataserver and cannot be used outside of the tape library. Utilization of ES Connection (ESCON*) Channels provides new possibilities in performance, connectivity, and remote tape operations. This model is supported on AS/400, RS/6000, and ES/9000 systems. The 3490-D31 is an 18-track, 1 Control Unit, 1-drive, tape subsystem. The Model D31 is a member of the IBM 3490 Magnetic Tape Subsystem, extending the reliability, performance, and operational efficiency of cartridge technology to a broad range of mid-range systems customers. The D31 is a single drive unit with its own integrated control unit and power supply. It is fully compatible with the existing 3480 family. This model has a larger, improved integrated message display to indicate drive status. As with the 3480 A22/B22, the D31 can support a channel data rate of up to 4.5Mb/sec. The optional Automatic Cartridge Loader and the Improved Data Recording Capability features can be installed to enhance system and operational productivity. The 3490-D32 is an 18-track, 1 Control Unit, 2-drive, tape subsystem. The Model D32 is a member of the IBM 3490 Magnetic Tape Subsystem, extending the reliability, performance, and operational efficiency of cartridge technology to a broad range of mid-range systems customers. The D32 is a two-drive unit with its own integrated control unit and power supply. It is fully compatible with the existing 3480 family. This model has a larger, improved integrated message display to indicate drive status. As with the 3480 A22/B22, the D32 can support a channel data rate of up to 4.5Mb/sec. The optional Automatic Cartridge Loader and the Improved Data Recording Capability features can be installed to enhance system and operational productivity. The 3490-D41 is a 36-track, 1 Control Unit, 1-drive, tape subsystem. The 3490 Enhanced Capability (3490E) Model D41 is a member of the IBM 3490 Magnetic Tape Subsystem family, providing significant performance and cartridge capacity improvements to mid-range and intermediate customers. The D41 uses the existing cartridge system tape and are read- compatible with earlier cartridge system formats, providing for ease of migration. The Enhanced Capability format (36-track bidirectional recording), together with standard Improved Data Recording Capability (IDRC), significantly increases overall cartridge capacity. This increased capacity and optional Automatic Cartridge Loader (ACL) combine to address the data capacity issues of unattended tape operations. Improved utilization of ES Connection* (ESCON*) Channels provides new possibilities in performance, connectivity, and remote tape operations. The 3490-D42 is a 36-track, 1 Control Unit, 2-drive, tape subsystem. The 3490 Enhanced Capability (3490E) Model D42 is a member of the IBM 3490 Magnetic Tape Subsystem family, providing significant performance and cartridge capacity improvements to mid-range and intermediate customers. The D42 uses the existing cartridge system tape and are read- compatible with earlier cartridge system formats, providing for ease of migration. The Enhanced Capability format (36-track bidirectional recording), together with standard Improved Data Recording Capability (IDRC), significantly increases overall cartridge capacity. This increased capacity and optional Automatic Cartridge Loader (ACL) combine to address the data capacity issues of unattended tape operations. Improved utilization of ES Connection* (ESCON*) Channels provides new possibilities in performance, connectivity, and remote tape operations. The 3490-E01 is a table-top version. See the Model E11 for the rack- mounted version. This Enhanced Capability model is a substantially lower priced 3490E tape subsystem designed for the RS/6000* and AS/400*. The 3490E family of tapes are the fastest, most reliable tape systems available from IBM for AS/400 and for RS/6000. It includes a seven cartridge Cartridge Stack Loader, a 16-bit, fast-and-wide, SCSI-Differential Interface, a 3490E tape transport, and an integrated control unit. The maximum effective throughput is up to 6.5MB per second. The seven-cartridge Cartridge Stack Loader provides an automated, unattended backup capacity of up to 16.8 GB with compressible data. Uncompressed, the capacity is up to 5.6 GB. Compression is provided by the 3490E's IDRC data compression hardware. The 3490-E11 is a rack-mount version. See the Model E01 for the table-top version. This Enhanced Capability model is a substantially lower priced 3490E tape subsystem designed for the RS/6000* and AS/400*. The 3490E family of tapes are the fastest, most reliable tape systems available from IBM for AS/400 and for RS/6000. It includes a seven cartridge Cartridge Stack Loader, a 16-bit, fast-and-wide, SCSI-Differential Interface, a 3490E tape transport, and an integrated control unit. The maximum effective throughput is up to 6.5MB per second. The seven-cartridge Cartridge Stack Loader provides an automated, unattended backup capacity of up to 16.8 GB with compressible data. Uncompressed, the capacity is up to 5.6 GB. Compression is provided by the 3490E's IDRC data compression hardware. The 3490-F00 is a table-top, low-priced, single drive 3490E designed for the RS/6000* and AS/400* systems. The 3490E family remains a fast and reliable tape system. Included are a 3490E tape transport capable of reading and writing 36-track and 18-track magnetic tape cartridges in compressed or uncompressed mode, a 16-bit, fast/wide, SCSI-2 Differential Interface, and an integrated control unit. The maximum effective throughput is up to 6.8MB per second. Media capacity is 2.4GB in compressed mode, 800MB in uncompressed mode. IDRC data compression is standard. The 3490-F01 is a desk-side, low-priced 3490E tape library designed for the RS/6000* and AS/400* systems. The 3490E family remains a fast and reliable tape system. Included are a 10-cartridge enclosed autoloader, a 3490E tape transport capable of reading and writing 36-track and 18-track magnetic tape cartridges in uncompressed or compressed mode, a 16-bit, fast/wide, SCSI-2 Differential Interface, and an integrated control unit. The maximum effective throughput is up to 6.8MB per second. The 10-cartridge autoloader provides an automated, unattended backup capacity of up to 24GB in compressed mode, 8GB in uncompressed mode. Media capacity is 2.4GB in compressed mode, 800MB in uncompressed mode. IDRC data compression is standard. The 3490-F11 is a rack-mounted, low-priced 3490E tape library designed for the RS/6000* and AS/400* systems. The 3490E family remains a fast and reliable tape system. Included are a 10-cartridge enclosed autoloader, a 3490E tape transport capable of reading and writing 36-track and 18-track magnetic tape cartridges in uncompressed or compressed mode, a 16-bit, fast/wide, SCSI-2 Differential Interface, and an integrated control unit. The maximum effective throughput is up to 6.8MB per second. The 10-cartridge autoloader provides an automated, unattended backup capacity of up to 24GB in compressed mode, 8GB in uncompressed mode. Media capacity is 2.4GB in compressed mode, 800MB in uncompressed mode. IDRC data compression is standard.